If you’ve ever tried to buy a turkey the night before Thanksgiving or, for those not living life on the edge, heard the tell-tale, “Clean-up in aisle three” message playing on a supermarket’s intercom, you can likely already predict the most common risk facing grocery stores. Grocery stores are aware of the dangers lurking on their floors. Regularly replacing slip-resistant mats, mopping floors, and using the right floor treatments are all standard components of ensuring the safety of employees and customers – important, yet challenging since cart-pushers bring their own limitations to the task of grocery shopping, whether it’s an elderly shopper with weak eyesight or a toddler running around in slippery soles, knocking down towers of tomato soup cans. That’s why major supermarket chains are turning to technology to ensure the safety of people coming into the stores. Argo Risk Tech is the platform that Gleason has perfected with his team and it’s utilized by many, if not most, of his clients. “Pretty much every supermarket chain in my book of business – you’re talking in excess of 1,200 locations in 40 states – is using this technology,” he said. The tech-based solution collects ‘big data’ from the floor of supermarkets, using sensors and other tech-enabled methods to track how often its employees walk around the floor and move from point to point, looking for hazards and eliminating them. The standard way is to just to do this stuff with a clipboard, but often the tasks won’t get done and it becomes harder to compile data, which can become critical during litigation on a slip-and-fall case to prove that a supermarket was meeting safety compliance standards. Argo’s platform also gives clients the ability to report incidents in real-time by photographing the spill, for example, and noting witnesses to the incident. Claims costs go down dramatically in these circumstances, according to Gleason, who said that if an event is reported on the same day that it happens, the costs and time needed to address the issue can be around 10 times less than if it was reported a week later. If Chipotle’s recurring issues with food borne illnesses haven’t made it clear, food safety is another critical risk for supermarkets and retailers in this space. Greens, meats, and any perishable items have to be kept at the right temperature and with an expiry date in mind. 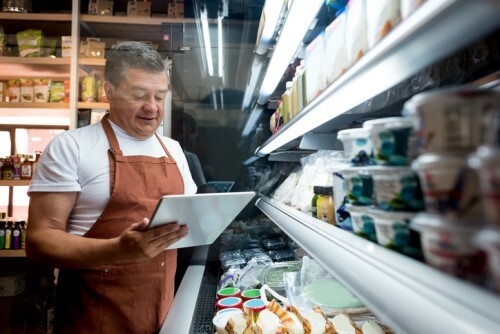 Stringent laws at multiple levels of government dictate food safety requirements, and the Argo Risk Tech platform takes the compliance activity in a grocery store and allows Argo to have the best knowledge on how its clients are operating, while acting as a source of documented defense for them if something does occur. “The supermarket industry is becoming more and more aware of the social responsibility aspects of keeping the people you’re inviting to your premises safe,” said Gleason.